ABCUSD Board Member Lynda Johnson. Area residents have contacted Hews Media Group-Community News concerned about the improper behavior of ABCUSD Board Member Lynda Johnson after the controversial July 19 meeting where Johnson singled out ABCFT Union member Gavin Riley on a technicality and attempted to exclude the 50-year ABC employee from a seat on the ABC Finance and Audit Committee. The conduct, according to one observer, should lead to ABC Board Censure or a Vote of No Confidence in Johnson. The two residents, who wanted to remain anonymous for fear of retribution, told HMG-CN that they were in the ABCUSD parking lot after the July 19 meeting and overheard an argument between Johnson and ABC Vice President Christopher Apodaca. “I heard some yelling and realized it was Lynda Johnson, she was yelling at [ABC Vice President] Chris Apodaca. The argument likely stemmed from the chaotic board meeting where Johnson held up procedure for over twenty minutes trying to remove Gavin Riley from the list of committee appointees. The controversy began when VP Apodaca nominated Hugo Enciso as his representative to the ABCUSD Facilities Committee. After Apodaca spoke, Johnson suddenly inquired about the appointment of Riley to the ABC Finance and Audit Committee based on his “employment status” with the ABC, and how it “deviated from Board bylaws. It was that move that threw the Board meeting into complete disarray. Twice Johnson attempted to stop public comment on the issue; twice she was rebuked by Board President Olympia Chen. Speaking on the subject of Gavin Riley, Hathaway said, “This is disgusting. Board member Johnson has also attempted to have me thrown off the Facilities Committee. Riley has been on Finance and Audit Committee for years, he was a teacher for 38 years, long-time community member and volunteer, you question Gavin [Riley] you question the ABCFT. After all the chaos and administrative maneuvers, the Board voted to approve Enciso’s appointment, with Johnson voting yes along with the six other Board Members. Apodaca then spoke about “what it is like to be a board member”, which likely sparked the obscenity-laced tirade of Johnson towards Apodaca in the parking lot. This is not the first time Johnson has angered the Board with her unprincipled actions. On July 14, 2014, HMG-CN reported that Johnson met in secret with then-Cerritos Mayor Pro-Tem Carol Chen to begin mapping out a strategy that would derail the $235 million dollar General Improvement Bond for the ABC School District. The statement that “your tax bill will increase hundreds of dollars” was a complete lie. Johnson knew that at the time, but did nothing. She went on to support Chen and the lies perpetrated by her allies. HMG-CN asked to attend the meeting but was denied. Several other residents of Cerritos wanted to attend the meeting but were turned away including former California Assemblywoman Sally Havice. Six months later the ABCUSD Board snubbed Johnson and elected Maynard Law as President of the Board. Johnson was nominated for President but lost on a 3-4 vote with Law, Board Members Olympia Chen, Armin Reyes, and Celia Spitzer voting no. 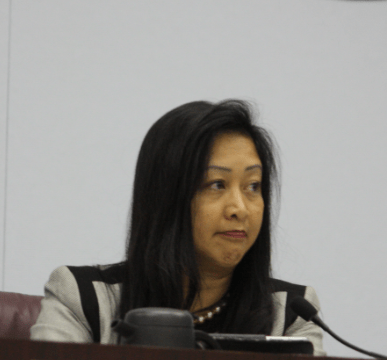 ABC members told HMG-CN that Johnson’s opposition to Measure AA and her alignment with Cerritos’ Carol Chen, who also opposed Measure AA, severely hurt her chance to be President of the Board. Now sources have told HMG-CN that Johnson is trying to payback Chen, asking Chen to step down as President and has “officially asked” ABC Board Members to hold a hearing to remove Chen. “She’s been very public in telling people that Olympia is senile and suffers from Alzheimer’s, and she is trying to remove her,” said the high-level source. HMG-CN is waiting a response from an email sent to Johnson for comment, she did not respond at time of cyber publication, but later did respond. She has been given the opportunity to comment for HMG-CN’s print publication publishing tonight.